Saxophonist Jim Tomlinson originally released The Lyric in 2005 on his own Token Records label, winning the 2006 BBC Jazz Award for Best Album. It's a skillfully crafted collection of standards, given graceful and stylish life by the husband and wife partnership of Tomlinson and singer Stacey Kent. The recording gets a 2011 mid-price rerelease on Blue Note Records, the couple's label since 2007's Breakfast On The Morning Tram. While the packaging has been updatedTomlinson adds a few more sleeve notes and Kent joins him on a new cover photothere are no changes to the album's thirteen songs. Few contemporary tenor players are blessed with a tone this warm and engaging. Stan Getz is an obvious reference point, but Tomlinson's sound is even more relaxed, and relaxing. Kent sings on all but two of the songs, with Tomlinson's taking the lead role on "Manhã De Carnaval" and "Outra Vez," with pianist David Newton adding some lovely phrases. The combination of Tomlinson's saxophone and Kent's sparkling vocals creates one of the finest musical partnerships in jazz: lushly romantic on "What Are You Doing The Rest Of Your Life," resolutely upbeat and cheerful on "Cockeyed Optimist" and just a little tongue-in-cheek on "My Heart Belongs To Daddy." The rhythm section players might not be as emphatic a presence as Tomlinson and Kent, but its delicately understated performances provide crucial support to the sax and voice. Drummer Matt Skelton is outstanding, with consistently inventive percussion that does much to establish the mood of each piece. Since the original release of The Lyric, Tomlinson and Kent have gone from strength to strength, innovating and experimenting with new writers and new interpretations of standards. The Lyric doesn't have this experimental edge, but what it does have is beautiful performances of beautiful songsmore than enough to justify its reinvigoration. Track Listing: Manhã De Carnaval; Corcovado; I've Grown Accustomed To His Face; If I Were A Bell; I Got Lost In His Arms; What Are You Doing The Rest Of Your Life? ; Cockeyed Optimist; My Heart Belongs To Daddy; The Surrey With The Fringe On Top; Outra Vez; Jardin D'Hiver; Something Happens To Me; Stardust. 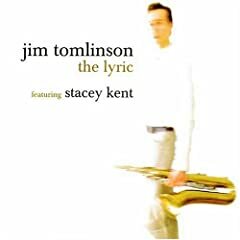 Personnel: Jim Tomlinson: tenor saxophone; David Newton: piano; Dave Chamberlain: double-bass; Matt Skelton: drums; Stacey Kent: vocals, whistling (11).